Much has been made in the past week or two about the differences between the NFL and college football. The Twitter-sphere has been a back and forth with all types of contrasts, ranging from pageantry to schemes to jersey numbers. One thing seems certain though: no matter if you like or dislike college football, NFL coaches continuously go to the college ranks for fresh ideas, new wrinkles, and innovation. 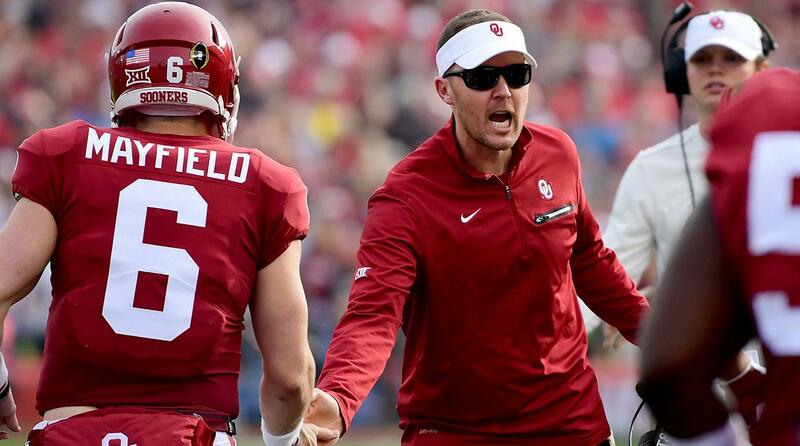 One of those sources in great demand this offseason is Oklahoma Sooners head coach, Lincoln Riley. Taking another look at an early season game against Greg Schiano’s Ohio State Buckeye defense (and its press quarters scheme) is to glimpse at a coaching clinic on how to attack a two deep shell defense in a high profile game. Breaking down this tape was not that much different than the NFL in terms of process, but massively beneficial in regards to rich content. What specifically can be drawn from this game that would interest NFL coaches? Many potential topics come to mind, but this piece will dive into two of them. 11 personnel has been the dominant personnel package in the NFL for more than a few years now, with the league average for 2017 slightly down year on year at 59%, according to Sharp Football Statistics. Many fans do not realize that no NFL team dips below 40% usage of 11 personnel, so basically the vast majority of teams operate about half their snaps in 11. For teams using 12 personnel (average use 19%) and 21 personnel (average use 7%), it is simply seen fewer and farther between. One of the more innovative users of 21 personnel, Kyle Shanahan in San Francisco, still did not get above 30% frequency last year. So it was refreshing to see the abundance of 21 personnel used by Riley’s Sooners against Ohio State and the success they had featuring it on well over half the snaps broken down. This 21 personnel look above featured TE Mark Andrews and FB/H-back Dimitri Flowers all over the formation. Schiano chose to match up against this personnel with his base 4-3 over front and mostly two deep safety looks pre-snap, as shown above. These deep safeties were not employed as many fans think, to “sit back and play pass.” Rather, they were asked to defend from a balanced position pre-snap ready to respond to the full field, often the target of offenses in college (and the NFL for that matter) that featured Spread elements. Optioning off of the SLB at the 2nd tier with a pitch back to a QB is something you do rarely see at any level. One of the main issues with option football is the hits a QB will take, but the pitch back here puts the QB at a good angle to get to the sideline, or the RB can carry on and take a hit instead. It is somewhat akin to the inverted veer shovel pass but with roles reversed, where a backside RB/TE/WR takes a shovel pass from the QB as he heads to the C gap, instead of the QB himself going north in the interior of the defense and taking that hit. There is no fake bubble screen as in the Sooners’ touchdown, and the corner route from the TE carries the deep safety help over. But it is a prime example of an outside slot slant against the SLB hybrid, and just how devastating a slot receiver like Agholor can be forcing a two way go. The SLB is a less athletic player that can be attacked in pass coverage like on these two plays. But if the defense switches in a lighter and more agile defender, then the run game can be of use as well. The field dimensions had little impact on the play, other than allowing the defense to disguise their blitz a little better as the WR3 was tight to the line of scrimmage. Lincoln Riley did not reinvent the wheel by using 3×1 formation that isolates the Sam Hybrid, but rather provided wrinkles that smart teams like the Eagles can use as they deploy it against tough defenses. The Oklahoma Sooner run game featured a wide range of run schemes through the early part of the season, and not just elaborate additions like shown above in the option pitch back. The offense ran everything from basic inside and outside zone, to their GT counter, to sweeps, traps, duo, zone read… the list is almost endless. Riley’s offensive unit seems to find an identity in running a lot of schemes, which gives them flexibility against the wide range of fronts seen in the Big 12. Slowly, more teams are moving away from predominantly running only gap or zone schemes, in some cases as a response to the wide ranging defensive fronts, but again team concept is important. 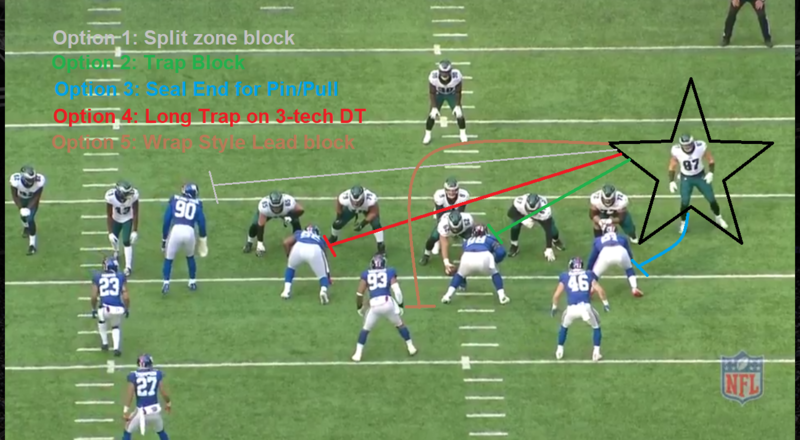 Watching teams like Philadelphia, Baltimore, Eagles, and Buffalo this upcoming season with Brian Daboll to just name a few, run expansive playbooks with versatile offensive lines for many reasons. This is not to take away from well known gurus like Alex Gibbs (outside zone pioneer) or Howard Mudd (Sean Connery look a-like, as well as legendary offensive line coach), who claimed that running a small slice of plays well is the best way to attack chaotic and violent defensive fronts. But the NFL rushing pendulum seems ripe to swing back towards the side of scheme agnosticism or at least openness. The effect of analytics will play a larger role in this as well in coming years, as success rates will be even further tuned to scheme. Upper tier rushing attacks do not or should not expand their playbooks just to show off how many plays their coordinator came come up with. Execution is paramount and this puts a lot of pressure on the coaching staff to both install and follow through. 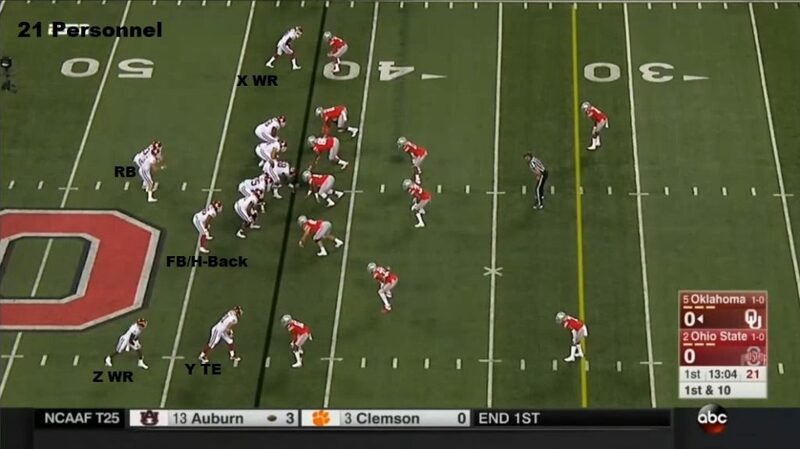 But it’s worth is found not only in running but in the play action game as well, where the Sooners showed many looks. This was much to the frustration of tape watchers trying to discern between play action and actual RPO’s (a topic deserving of its own piece). Why include a sack when describing play-action, especially in a game where there was so much success in using it? Riley is aggressive in his calling creativity and sometimes that means mistakes, such as sending a center (even from a play-action set), to try to pass block defensive end Nick Bosa. The result was (predictably) negative, yet this is part of the process to establish boundaries for what the offensive line can and can not do. NFL play-callers stay within their lanes for many good reasons, most of which is keeping employment. But that type of attitude leads to a following the herd mentality, copycatting and just flat out “beta” to steal a word from finance. Phil Simms recalled a saying of Bill Parcells with a bit of an allusion to his unease in flying: “You can’t be afraid to go down in flames.” Riley’s sure handedness adjusted the altitude often, maybe not to the Parcells level of endangering the plane, but much more so than the average or even experienced pilot. This is not to ignore the positives of play-action in this game, as fullback Dimitri Flowers showed throughout the game. Ted Nguyen had a great article on Riley’s use of pop passes off play-action, and he included Flowers’ touchdown in this game as one of his examples. Flowers other 6 receptions were not flashy touchdowns, but some built off of slice blocks or sifting (hat tip to Mark Bullock, he is a must follow on Twitter @MarkBullockNFL) throughout different stages in the game. Please see the below two plays, the first from early in the game on a split zone run and the second on a key 3rd and long late in the 4th where Riley wants a high percentage throw with the outside shot of getting the first down. The above image shows a handful of plays the Eagles are a bona fide threat to run. The varying runs enhance their play-action game not because of the resulting success of the run, but because it was executed and thus shown to the defense. The defenders then see the same run keys with very different outcomes, leading to a natural level of hesitation. Lincoln Riley capitalized on this hesitation. In this game against OSU, Riley defeated Schiano’s defense not through low percentage throws and plays to the sideline (a goal of press quarters), but head on against some of its strengths. At least two aspects, the run game and personnel, are more than worth studying. To be honest, these two just scratch the surface, this game was overwhelming on a pure X’s and O’s basis. Ultimately, games like this transcend leagues and levels, and pay homage to the phrase “ball is ball,” even if there are more than 53 players on a sideline. Follow Nick on Twitter @TManic21. Check out his other work here, such as his look at Giants rookie QB Kyle Lauletta, a breakdown of the Giants offensive scheme under Pat Shurmurand how AJ McCarron has evolved from his time at Alabama.